Australia finished in second place in CAF’s World Giving Index, narrowly missing out to Indonesia which topped the index for the first time. 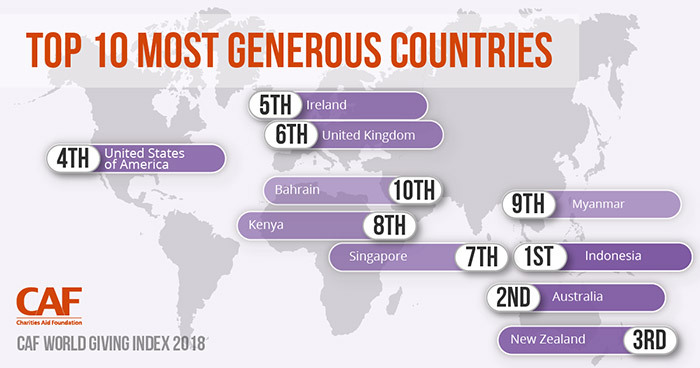 Australians performed well across the board, finishing third in donating money, sixth in volunteering their time and 24th in helping a stranger. According to the NAB Charitable Giving Index 2018, the rate of charitable giving in Australia increased by 1.2% in 2017. But overall growth in giving was still reported as being relatively weak, and below the average growth rate. “Whilst I am thrilled that Australia has made it to the second most charitable country in the CAF World Giving Index, we still have a lot of work to do. Giving is vital for charities supporting communities in need. And in order to grow giving, we need to ensure we make it quick and easy for donors to give by utilising new technologies. This year’s CAF World Giving Index has found that more people across the world are helping a stranger and volunteering their time compared to last year, but the proportion of those donating money has declined for the second year in a row. “It is forever humbling to see how people across the world continue to be moved to help others, giving their time, donating money and helping strangers. It is a basic human instinct to lend a helping hand, and it is always amazing to see how people in countries which have suffered conflict and natural disasters are stirred to help those in need. Levels of giving across Africa are continuing to grow, confirming a trend which appeared in last year’s Index. Myanmar, the most generous country on earth for 2017, fell to 9th place in the rankings, owing largely to a fall in the number of people volunteering. New Zealand rounded off the medal places in third, whilst the United States finished in fourth. How does the World Giving Index work? The CAF World Giving Index 2018 includes data from more than 150,000 people in 146 countries that was collected throughout 2017. In most countries surveyed, 1,000 questionnaires were completed by a representative sample of individuals living across the country. In order to establish a rounded measure of giving behaviour across the world, the CAF World Giving Index relies on a simple averaging of the responses from the three key questions below. Each country is then given a percentage score and countries are ranked based on these scores. When looking at Australia’s performance against other countries we are performing well, however this is also dependent on other countries performance. The World Giving Index is primarily based upon data from Gallup’s World View World Poll, which is an ongoing research project carried out in more than 146 countries in 2017 that together represent around 95% of the world’s population. The survey asks questions on many different aspects of life today including giving behaviour. The countries surveyed, and questions asked in each region varies from year to year and is determined by Gallup. More detail on Gallup’s methodology can be viewed online. Good2Give was originally launched in 2000 as Charities Aid Foundation (CAF) Australia, and continues to be a part of the CAF Global Alliance representing Australia and New Zealand. CAF (Charities Aid Foundation) is a leading international charity registered in the United Kingdom, with nine offices covering six continents. We exist to make giving go further, so together we can transform more lives and communities around the world. We are a champion for better giving, and for over 90 years we’ve been helping donors, companies, charities and social organisations make a bigger impact.